The Briton Leon Greenman, born in 1910, is a lively elderly Jew with a fabulous memory and a gripping, never faltering narrative style. 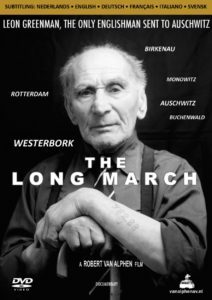 Not surprisingly, he has been telling his story in classrooms since 1946: how he was picket up from his house in Rotterdam with his wife and small son at 21:30 on 8 October 1942, transported to Westerbork and brought from there to extermination camp Birkenau, where he saw his wife and son for the last time, and that today he is one of the few survivors of the twelve thousand Jews who were deported from Rotterdam. “I keep telling the story in the hope it will never happen again.” For his work he recently received a British Royal Honour. This time Greenman tells his story to the camera of director Robert van Alphen, who fortunately allows his protagonist ample time and takes him to the relevant places of yesteryear. Documentary, DVD PAL, region free. English spoken, subtitles in Nederlands, English, Deutsch, Français, Italiano and Svensk. Length 50 minutes.